I always pictured waking up well-rested, full of grace and smiles on my wedding day. Though I barely drank a drop of alcohol and was in bed by midnight the night before, the morning of Jon’s and my wedding I absurdly woke at dawn and threw up twice. While my Dad busied himself cleaning up after me, I managed to eat some oatmeal and a banana. And then, I projectiled a little bit of that onto the couch and the nearby mirror. My Dad peeked around the corner and we both began to laugh. He said aloud exactly what I was thinking; he’s been cleaning up after me since the day I was born, so why should my wedding day be any different. Thankfully the day got better from there. The week before the wedding, I'd lost the ability to take deep breaths, my appetite, and at least five pounds, but that morning I was ravenous. We headed to breakfast at a greasy spoon down the road. I scarfed down toast, eggs, fruit, grits, and lots of water. Both my Dad and the waitress were a little wide-eyed over my large order. That'll be extra, that'll be extra, the waitress repeated. Dad stole a few bites of fruit in between spoonfuls of his buttery grits. My food tasted fine, but I was in it for the nourishment, not the pleasure. I ate mechanically, one bite following the next, with a few mini-breaths in between. The fork was the airplane, my mouth the landing pad. Or maybe I was the airplane and the “I pronounce you husband and wife” was the landing pad. I wrapped the one slice of leftover toast in a napkin but forgot it on the booth seat. In between hair, makeup, and getting dressed, I ate Luna bars and gnawed on the buffalo beef jerky that Dana, my Maid of Honor, brought to me. The primal nature of the jerky eased some of my anxiety, though I felt like a dog with a chew toy when I ate the thicker pieces. There’s really nothing classier than a fully made-up bride gnawing on smelly pepper-covered leather! The wedding was exactly what Jon and I wanted – intimate, lovely, fun and tasty. A few months before, we enjoyed brainstorming, tasting, and adjusting our wedding menu with the caterer. At the tasting we lowered the heat level on the appetizers and switched the sauce on the meat entree from fruity to tomato. We decided it'd be okay to serve some heavier dishes since it wasn’t yet blazing hot in Charleston, and we chose not to serve pork or shellfish out of respect for our more religious guests. A buffet was an absolute must since it’s Jon’s favorite way to eat, and a Southern-themed menu was my insistence as I wanted to show off Lowcountry cuisine to Jon’s Northern family. During the cocktail hour, mint julep lemonade was passed, along with appetizers like mini Duck Johnnycakes. These are basically pancakes made with fresh corn and cornmeal and were especially exciting to us because, aside from the name coincidence, we waited over two years to eat them. Well, not those ones exactly, but the dish itself. When Jon was in school in Boston, we took a daytrip to Newport, RI, in part because we’d seen a Rachel Ray show that took place there. We arrived and headed straight to the restaurant where she ate these great looking Jonnycakes. Sadly, they were sold out. The duck on our long-awaited cakes was tenderly cooked with a mildly spicy pomegranate glaze. On the buffet were, as Jon likes to say, some “very special” fried green tomatoes. They were coated with a light layer of panko breadcrumbs, and were neither too fried nor too greasy. Goat cheese crumbles and sweet red pepper relish accompanied them. I like that a traditional Southern dish can be turned on its head a little and made lighter like that. And, Fried Green Tomatoes at the Whistlestop Cafe is one of my favorite childhood books. Over a decade after visiting there, I still think that the best lemonade I’ve ever had was in Juliet, Ga., the town where the movie was filmed. Our first entree was braised beef short ribs in tomato gravy served over slow cooked creamy stone ground grits. The grits were artfully prepared—hearty, thick, and rich, as though tended to by a gentle hand for many hours. The meat fell apart on the bone and the gravy was sop-it-up good. When Jon and I first met, I didn’t eat meat and he didn’t eat fish. A very sentimental metaphor can be drawn between how both our lives and our food preferences have grown together since. Apparently I was extremely caught up in the moment when I went to our buffet, as I didn’t put nearly enough food on my plate. By the time one of my bridesmaids returned with seconds, it was time to get up and visit with our guests as they ate. So, most of my memories of the food are from the tasting, which was back in November, though I clearly remember what it looked like on other people’s plates. Apparently, no matter how much you love food, what they say about not getting to eat at your own wedding is true. Luckily there was half of a Luna bar left in my dressing room, which got me through the rest of the night. Oh, the irony. To ease our pressured timeline and balance the weight of the dinner, we skipped a cake, which had no real meaning to us, and chose a sampling of benne (sesame) wafer cookies, praline brownie bites, and lemon bars. Neither Jon nor I actually ate dessert because we were out dancing. That was fine though – after seven years of dating and a hectic five months of co-planning every detail of our wedding weekend while living in different states, ending the day as husband and wife was the sweetest thing imaginable. I’m not sure, but I can imagine that as we smiled our way down the walk towards our getaway car, my Dad quietly passed the “cleaning Jennifer’s throw up, etc.” baton to my new husband. I have no doubt that Jon will humorfully, lovingly and honorably carry it. Newly reinstated Southerner that I am, I've happily embraced the irony of my new favorite thing to cook. I've always known sweet potatoes were associated with the South, and with some Internet research under my belt can now say why -- they were originally brought to the U.S. via the South around the 17th century (along with other East African foods like sesame, peanuts, okra, black-eyed peas and collards). Unlike a lot of other Southern associated foods, they're actually really good for you, high in fiber, protein, iron, calcium, complex carbs, and vitamins A and C. Turns out that Louisiana is the third largest sweet potato growing state in the country, after California and North Carolina. Recipe: One large sweet potato is enough for two people. Preheat oven to between 350 and 400 degrees. Julienne potato and lay on a baking pan. Drizzle with a little olive oil and sprinkle with table salt or sea salt if you have it. Bake for around 45 minutes, until the sweet potatoes are sizzling and a little crisp. And it's probably a good idea to turn on the oven fan so that you don't have to interrupt your cooking groove to fan the smoke alarm. Twice. Whoops. I'm still figuring out the best way to lay the potatoes on the baking pan, testing out using cooking spray vs. no cooking spray, foil or no foil, and how much olive oil to drizzle. I'm also still working on my cutting skills -- me thinks a mandoline will be my next kitchen purchase. Though the fries don't really need a dipping sauce, you can use ketchup, or mix low-fat mayo with red pepper and enjoy the kick. You can also toss some onions in with the potatoes for extra flavor like I did in the picture up top (onion goggles and all!). Another option is to grate a light layer of cheese like parmesan or gouda on top when they come out of the oven. Last night to accompany the fries (yes, I'm so addicted that the fries need the accompaniment and not the other way around), Jon and I made portobello mushroom burgers. I found this recipe on Food TV's site and doctored it to suit my mood. For the marinade, I substituted basil for rosemary, and for the cheese I mixed some more basil in with goat's milk feta and a little cracked pepper. We don't yet have an outdoor grill, but the stovetop grill pan did the trick. Each side cooked for under five minutes and when the mushrooms were gill side up, I topped them with the cheese mixture and let it melt a bit. The wheat buns were good toasted and spread with a little of the mayo sauce. For dessert, we melted hot fudge sauce onto slices of angel food cake (which is fat free) and dotted them with blackberries. All in all, a pretty healthy meal for any region's standards. A week before Jon's and my wedding, I went over to my Aunt and Uncle's house. She was preparing 20 lbs. of fresh tuna for our day-after-the-wedding brunch at their beautiful home. The house is like another member of my family, one who has supported me through both the best and the roughest of times. Many of the rooms, including the kitchen, have gorgeous views of the marsh, inlets and the Carolina Intracoastal Waterway. Previously my Aunt had marinated the tuna with olive oil, soy sauce, salt, pepper, garlic and ginger. As I watched her sear it with butter, I took in the fact that all of her work was being done in honor of Jon and me. For our wedding. That in just over a week, I'd be back at their house eating the tuna while surrounded by family and friends, and I'd be married. It was exhausting and exhilarating at once. As the tuna cooked, my Grandma, who lives around the corner, stopped by on her afternoon walk. Three generations of Coleman women stood in the kitchen, feeling the heat and hearing the sizzle of the three saute pans. One, an expert at making old world food like brisket, fried salmon cakes and the best latkes you've ever tasted. One, who is revered for her hospitality, entertaining prowess, and fresh, delicious, nourishing meals for groups of four or forty. And me, a voracious and experimental eater since childhood, who would like to take the culinary know-how of my closest relatives and friends, unravel it, and create my own kitchen traditions. When I left the house to head back into the world of pre-wedding chaos, I took with me the strength and love I'd felt in the kitchen. 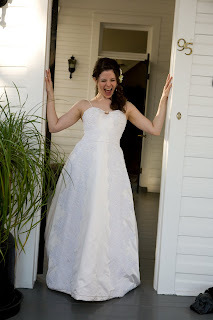 It helped carry me through the final wedding countdown, and followed me right back up the steps of the house a week later when Jon and I crossed the threshold as husband and wife. The tuna, now coated with black sesame seeds, was tender and flavorful. I ate it like someone who'd never had tuna before, noticing its thin sinews and its grain as my tongue went with and against it. I piled it on my plate again and again, savoring both the newness and familiarity. It was the end of a positively foul week, on a day that I was determined to make lemons out of lemonade (figuratively and literally) because it was Jon's 32nd birthday. He has a history of bad birthdays--see birthday #30, when he was living in Boston and I sent him on a treasure hunt to pick up the ice cream cake I'd ordered and purchased, but, sadly, the store lost my credit card information and he had to buy his cake himself. As the lemonade finished chilling, I received via post one of the best gifts ever. A cookie cake. If the cake had tasted like cardboard, it still would have been incredible because it was sent with such thought by two of my very best friends. But this cake, OH, this cake -- it was marvelous. Upon first bite, my surprise and delight echoed down the hall of our house. "Oh my god." At times like these, I wish my first responses could be more original, but who has time for words when they're wide-eyededly savoring the awesomeness that is Forget Me Knot's cookie cake. Ringed with yellow buttercream and green frosted flowers, the kind of frosting that tastes like Crisco in a good way, the thin chocolate layer on top is only a teaser. The cake is at least an inch thick, and dense with the burden of semisweet chocolate chips. It's baked a little raw, so it's like eating cookie dough in cake form. Unlike the ones from the mall that I ate at arcade birthday parties as a kid, this cake tastes and smells of fresh butter, sugar, and chocolate. If there were such a thing as a cookie cake farm, this one would win a smattering of blue ribbons at the county fair. I was already set to make birthday cupcakes for Jon that day (I wasn't about to try a cake as I hadn't baked in a long while--more on that birthday meal soon), so we ended up with both leftover cake and cupcakes. I tried to be good, I wanted to make the cake last. I cut it into slices, and froze them individually wrapped. That didn't take. The next day when I raided the freezer, I discovered my cake was even better chilled. A few days later, when it was all gone, I started concocting wild fantasies of valid reasons why I should order another. Then I bought cookies, cookie dough ice cream, and frosting, trying to duplicate my present, but when your point of comparison is the best cookie cake ever, it's not so easy. I comforted myself with cupcakes, and eventually pulled through. Thankfully, my birthday #30 is coming soon, and this is one cake I'd be happy to buy for myself.